At the hilltop in Dundonald village, archaeologists have found evidence of settlement dating as far back as the Bronze Age and a fort built in the Iron Age. In the 12th Century an earthwork castle was built by Walter, the first Steward of Scotland, and this was replaced a hundred years later by Alexander, the 4th Steward. The latter was destroyed during the Wars of Independence, possibly by Robert the Bruce himself, so it wouldn’t fall into the hands of the English. The ruined tower house that still stands today was built around 1371 by Robert II soon after he was crowned king of Scotland, making it the third castle to be built on the site. Robert II was the grandson of Robert the Bruce. Born in 1316 he was the son of Bruce’s daughter Marjorie and her husband Walter Stewart, the present High Steward of Scotland and descendant of Walter, the first Steward. Robert thus became the first of the Stewart monarchs (later known as Stuart), who ruled Scotland and subsequently England for 300 years to come, making Dundonald Castle the birthplace of the Stewart dynasty. Robert II spent most of his reign at Dundonald, which was his favorite castle, until his death in 1390. Dundonald Castle and visitor centre displays an exhibition with models of the different constructions the site has been home to through time; from the Iron Age fort to the 14th Century castle of King Robert II, as well as a collection of artefacts found in the area. When you visit, you can get a guided tour by one of the local community historians, who holds the greatest knowledge of Dundonald’s rich history. Furthermore, if you are interested in doing family research or are working on an academic project, or want to dig into the historical and archaeological information about Dundonald and its surroundings, Friends of Dundonald Castle can help you access local archives with documents, records, letters, maps and photographs from the local area. 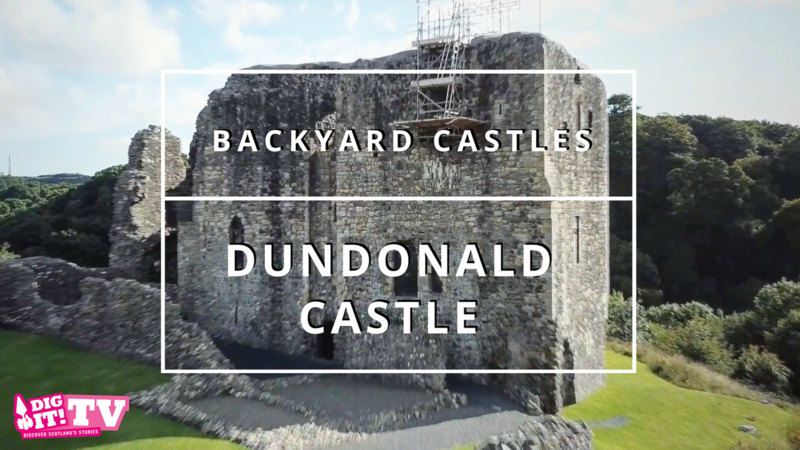 The Education team at Dundonald Castle welcomes school visit with activities tailored to all age groups, and within a great range of topics, including Archaeology, Vikings, the Wars of Independence and many more. The children get to dress up as knights and princesses, see medieval weaponry and falconry, or learn about how an archaeologist works. The visitor centre and café provides a gathering place for community events, like knitting classes and a scrabble club, but also act as a venue for larger events, such as Book Week Scotland or the yearly Dundonald Highland Games. You can also host your wedding there! Dig It! is a celebration of Scottish archaeology with events from organizations across the country and resources that will send you across the centuries. Whether you’re digging into a Minecraft map or uncovering hidden gems on YouTube, it’s all about discovering Scotland’s past, present and future stories. We are a leading educational charity working to inspire people to discover, explore, care for and enjoy Scotland’s archaeological heritage. We co-ordinate the Scottish Archaeology Month in September (a bonanza of mostly free events across Scotland); we advocate for Scotland’s heritage; we run Adopt-a-Monument for community groups and promote the use of archaeology in the classroom and lifelong learning. We are the lead body for Aim 4 of Scotland’s Archaeology Strategy which is all about encouraging greater engagement and we run the amazing Heritage Hero Awards too. Our journal, Discovery and excavation in Scotland is the “go to” place for finding out what fieldwork has taken place in Scotland each year since. Is a charity whose goal is to help communicate the past to the future. We currently work mainly in creating informational videos and filming conferences. Click here to watch their Youtube Channel.